UpCalD unflavored calcium citrate powder supplement eliminates the challenge of swallowing large pills. Vitamin D3 is added to aid in calcium absorption. 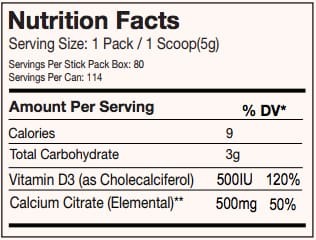 Each 5g serving contains 500mg of elemental calcium citrate plus 500IU of Vitamin D3. Easy-to-mix powder helps you meet your daily Calcium and Vitamin D3 needs and is Bariatric and osteoporosis friendly! Hot beverages: coffee, tea, hot cocoa, etc. Cold beverages: juice, water, iced tea, etc. Snack foods: yogurt, oatmeal, pudding, etc. Instructions: Stir one serving of UpCalD® into 2-8 oz of any beverage or soft food.